At Silicon Valley Comic-Con this weekend, Loot Crate, the company that defined the monthly mystery subscription box category for geeks, gamers and pop culture lovers, today announced its newest monthly subscription,Loot Crate DX. Created especially for fans who are interested in higher-end products, merchandise and collectibles, Loot Crate DX takes the company’s flagship mystery box experience to the “next-level” by delivering even more exclusives and higher-quality geek and gamer gear from the biggest, newest and most sought after franchises. The first Loot Crate DX monthly box will feature sought after collectibles from franchises such as Adventure Time, Legend of Zelda, and World of Warcraft. Each crate will follow Loot Crate’s inventive monthly theme and feature collectibles, apparel, home goods and more for a total retail value of over $100.00. 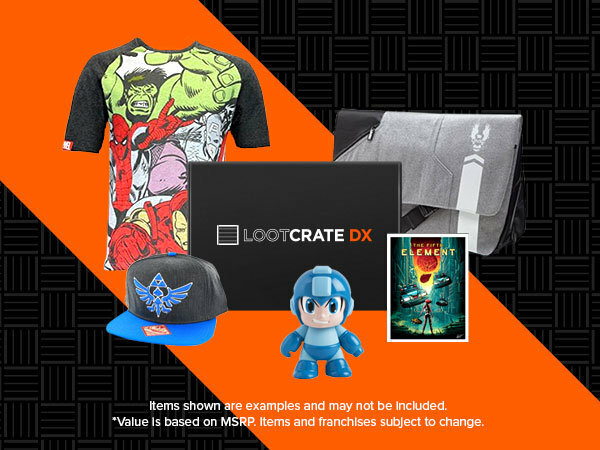 Fans can sign up for Loot Crate DX starting Monday March 21st, 2016 at www.lootcrate.com/lcdx. Loot Crate DX is priced at $49.99 (including shipping and handling). In January of 2016, Loot Crate announced Loot Gaming, the company’s first monthly mystery box subscription dedicated to the biggest and best video game universes. Already, the first Loot Gaming crate, slated to ship in April, is sold out. Loot Crate’s new Anime line, now in partnership with Crunchy Roll, has also consistently sold out each month since launch. With more than a half million Looters for its flagship subscription service, Loot Crate has relationships with the hottest video game, entertainment and consumer product companies in the world, including Disney, Warner Bros., Nintendo, Activision, Minecraft, Bethesda and many more.